When I saw this conversation between my friends on twitter, I knew that I must try the best chicken wings in Singapore that they were talking about. We even created a blackberry group nicknamed: har cheong gai to discuss and plan for our assault at No. 5 Emerald Hill Cocktail Bar for their famous chicken wings which are marinated with shrimp paste. ‘Food Blogger conned to No. 5 Emerald Hill with the lure of best chicken wings in Singapore.’ After praising the chicken wings to the sky, my friend was a little worried about my expectations of it, and teased me with this headline. When the waiter brought the basket of chicken wings ($17 for 6) to our table, my brain was whispering to the stomach: you know what, this better be good! “Dear god, or whoever that is listening, please, please let the No. 5 Emerald Hill’s chicken wings be the best prawn paste chicken in Singapore.” I prayed. I took one by the side, and placed it carefully into my mouth. At that point, I did not care whether or not the wings would burn my tongue and make me go oww. As sadistic as it might sound, I’d probably remember the har cheong kai better if it burnt me. Anyway, No 5 Emerald Hill’s Har Cheong Kai was extremely crispy. It wasn’t oily, nor was it too dry. 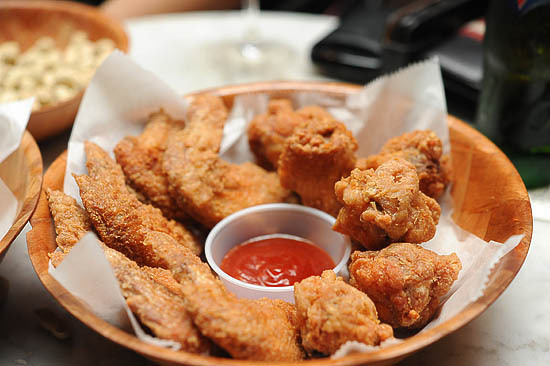 The wings were great as finger food, the perfect snack to wash down with a jug of cold icy beer. While they were excellent as chicken wings, one would probably not classify them as Har Cheong Kai since the prawn paste flavor wasn’t strong enough. While the pizza wasn’t outstanding, it was not too bad for pub grub. Thin-crust, light and not too filling: the excuse for you to eat again after dinner. The fish from the “Fish and chips” was disappointing. The saving grace was the fries, which quickly filled our stomach. “Why does the beef stew tastes like salmon?” This was one of the funniest comments made when we were at No. 5 Emerald Hill. It actually tasted like a normal beef stew to me. Nothing fanciful, something warm and hearty to go along with the bread. No. 5 Emerald Hill Cocktail Bar has a 1-for-1 Martini for just $16 (from 9pm to 1am), which is a very good deal. Martini plus chicken wings after a long day at work? Sounds like a plan to me. Edited (I forgot to include this para): I had a shock when I first stepped into No. 5 Emerald Bar. Everyone was throwing empty peanut shells on the floor. If you want to litter in Singapore without getting fine, No. 5 Emerald Bar is probably the place to go! Even though it was a little awkward initially, the place soon unleashed the monster in me. It felt so liberating to throw empty peanut shells onto the floor! Do you have any recommendations of any good pubs/bars in Singapore to chill out? // The Emerald Hill restaurants and pubs are located directly opposite 313 @ Somerset and Orchard Central. I love your posts! When I go back to Singapore, I’m definitely gonna try out some of the places you blogged about AND thanks for stoppin’ by my blog. You’re the first person who has visited!! Hahaha..
You may want to try the Chicken Wings @ Ice Cold Beer at 9 Emerald Hill. Their pizza is also great! $17 for 6 wings? Wow, that seems a bit pricey…. their mini beef burger is superb too. 2 or 3 minis per serving. there’s 3 pubs there, all serving same kind of wings actually. ice cold beer, que pasa and no 5.. The chicken wings at ICB aka Ice Cold beer are the same as those at No 5 They are all part of emerald hill group it’s my fav. chicken wings too.. it’s a must eat everything i am there. Pizza looks great! Nice and rustic! JT: Mini burgers? roger that! orange: i heard so much about the peking duck pizza from timbre, have you tried that before? Have you tried the chicken wings at Nuoc at Orchard Central? Those are delicious. Eat them on the relaxing outdoor patio and wash them down with a Saigon beer…Delicious…. Absolutely love everything about No. 5 and Ice Cold Beer! great! and when you do, let us know your thoughts! yup i tried the roast duck pizza, is nice but is not my favourite, but many of my friends love it! love the cripsy cracker on it though! you should try it for yourself to see! I went there once and was informed by a waitress that they do not serve to customers under 25? At that point in time, I didn’t care and just hopped to alley bar instead. But can anyone confirm this for me? Cos I’m dying to try those wings. Someone told me how great the ICB’s chicken wings were that he and his friend had three servings at one go. Hence, started google about it and saw your photos and comments. And I think I am convinced. Will be there this Thursday to chill out and plan to skip lunch for the craving for chicken wings! Another wonderful memory: We had our wedding photoshoot done there! The food is gd, d place is quite happening w nice music but unfortunately the staff are so rude,& the service is BAD. u can try out one of the hong kong aunty selling this at chinatown smith street hawker centre (HK Mong Kok Kui Ji Kitchen – Blk 335 Smith Street #02-217 Chinatown Complex Food Centre). A plate of about 8pcs @ S$8. May i know about the bartender named aska? He’s very nice n a lil bit cute.